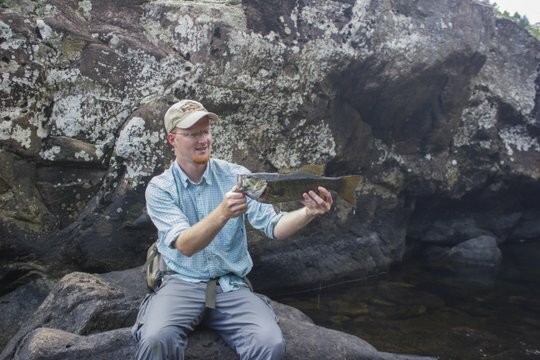 Some guide trips are routine, while others are definitely a little out of the ordinary. 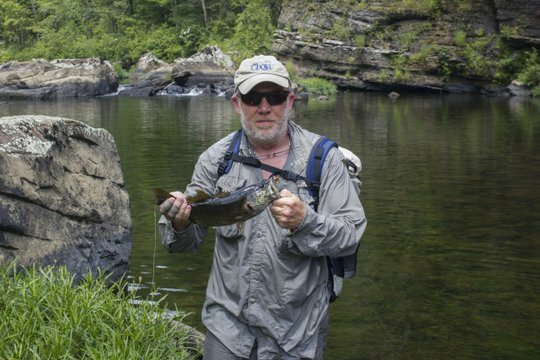 This past Monday, I had a half day guided wade trip on the Caney Fork River. We had moved around trying to stay ahead of the generation that has been a challenge lately. We found several willing fish on midges and nymphs (mostly midges) early in the day as well as a few that ate the hopper but didn't find the hook. When the water started rising, it was time to move and move we did. We found another good section with more favorable water conditions and started fishing again, knowing that we had limited time before the rising water found us. I had mentioned wanting to try a certain section and Terry who was fishing with me was all for it. Moving down the river, we were approaching our target spot when I froze. My nose detected the definite smell of Japanese beetle. I know this sounds unbelievable, but the pungent and unmistakeable smell of beetles made me look up. Sure enough, the tree that was hanging out over the river nearby had lots of beetles eating away on the leaves. Knowing at least a little about such things, I quickly deduced that instead of a midge behind the hopper, it was time for my favorite, a black beetle. Terry was soon maneuvering into position and made a great cast to a brown trout I had spotted. Immediately the fish nailed the fly. This scene replayed itself again and again over the next hour. Most of the fish were brown trout, but at least one or two were rainbows. Catching fish on dry flies on the Caney Fork River is always a treat and this day was no different. Before long, we had to make a beeline for the bank because the water was catching up, but we had already caught several fine trout. 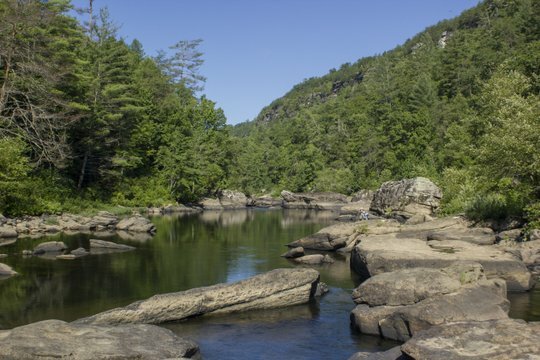 Next time you are out on the river during the summer, make sure to stop and smell for beetles. You might just luck into some great fishing! 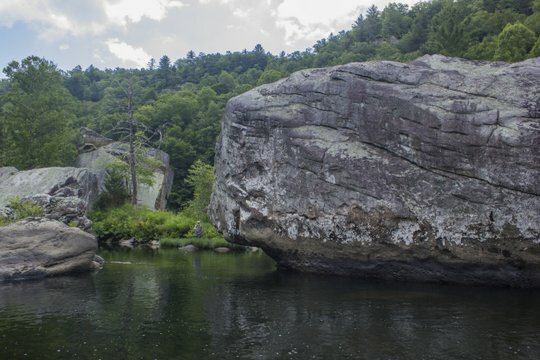 This was supposed to be a fishing trip deep into the backcountry of Tennessee's Cumberland Plateau in search of smallmouth bass fishing nirvana. My friend Mark Brown of Chota Outdoor Gear and I had been planning on fishing together for a while. Somehow things had never worked out, until this trip that is. 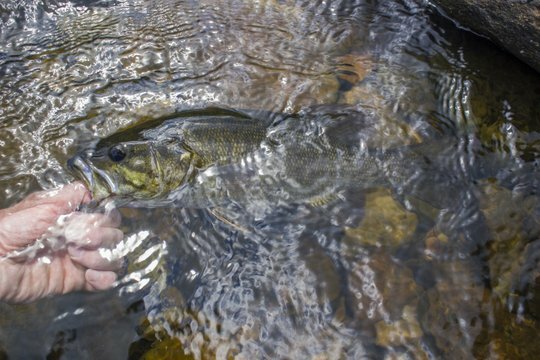 We both had been hitting the smallmouth streams regularly this summer and were looking to get a little farther away from the access points and the hordes of swimmers and other fishermen that can usually be found in easily accessible water. There were a couple of options under consideration, but ultimately the choice was made for a slightly longer walk but one that would leave our vehicles in a safer location. The forecast for our day on the water called for hot and dry, in other words about the same as the rest of this summer has been. We hit the trailhead by around 8:30 a.m. and started trekking deep into the still-cool woods. The trail was familiar to me but not to Mark so I took the lead. As I started sweeping spider webs out of the way with my face, I started thinking that maybe being in front wasn't such a good idea. For some reason Mark was still happy to stay in the back so I forged ahead. By the time we hit the trail down through a crack in the cliff, we were both ready to see the river below. 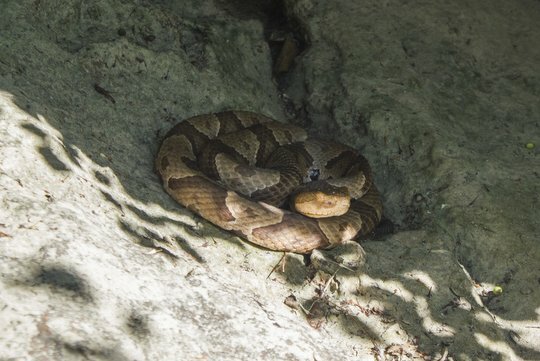 Just as we got to the narrowest portion where the trail was hemmed in by steep bluffs on both sides, I happened to look down in time to see a timber rattler relaxing on the trail. I was in such shock that I forgot to snap a picture. This didn't help my nerves. There are more snakes here on the Cumberland Plateau than anywhere else I've ever hiked and fished, and I was already jumpy. Things didn't improve when we looked down the steep and brushy hillside that had to be descended before our goal was attained. I imagined all of the snakes and bees that were probably waiting to eat me. In the end, visions of huge smallmouth slamming our flies propelled me on down the hill. We emerged stream-side to stare in awe at the incredible water both up and downstream of where we now stood. Towering sandstone bluffs showed near the top of the gorge. If only these streams were more accessible, but of course in that case we probably wouldn't be the only ones enjoying the view. After a brief pause to enjoy the scenery and snap a few pictures, we both started casting. 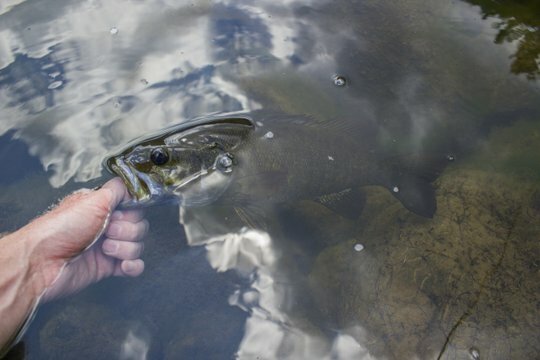 Smallmouth bass were cruising the deep pool at our feet just waiting for the flies we had ready. Within the first two or three casts, I had landed my first bass and Mark was not far behind. After catching three bass in 10 or 15 casts, my expectations for the day, as if they weren't already high enough, shot through the roof. Becoming greedy, I started thinking about catching larger fish. We had emerged from the woods towards the back of a large pool, and I imagined that there were probably large bass stacked like cordwood at the head of the pool. The Grass is Always Greener Syndrome was in full effect. The water was too deep to wade, so I moved around behind a large boulder to search for a route to the head of the pool. Looking over, I noticed a copperhead coiled up on top of a large rock and my big fish dreams quickly came back down to earth. Our first pool was now dubbed the Copperhead Hole. Knowing that there was plenty of water downstream, I decided to abandon my efforts and head down to the next pool. Fishing quickly through some pocket water, I soon found myself overlooking a long pool. Because of a huge deep pot in the back that required getting deeper than I intended, this pool was named the Swimming Pool. Thankfully I didn't have to completely swim, but we did find some quality smallmouth cruising this pool. While I wasn't rigged for it, the pool sure looked like a good muskie hole as well. One of these days I'll be back to explore that possibility. 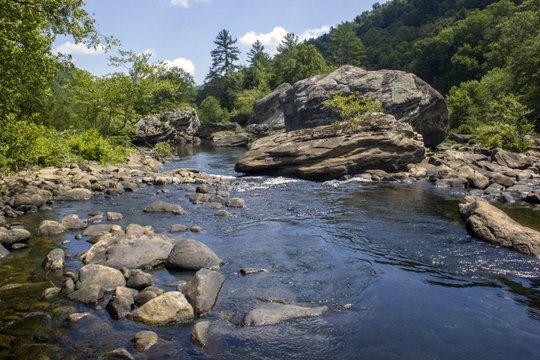 We continued downstream into a section that looked like giants had tossed huge boulders all over the river. Some of these are as large as a house. 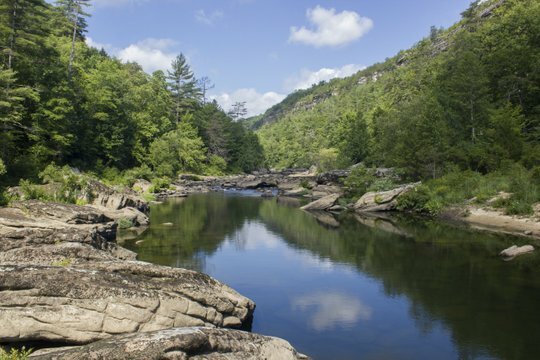 Here is a view looking downstream and another looking across to where Mark was fishing to give perspective on how large these rocks were. Can you find the angler in the second picture? It was here, in the narrows, that I started to find some larger bass. I had switched from a large black Chernobyl style fly to a subsurface offering. Despite hearing cicadas buzzing in the trees along the stream, the bright sun was winning out and the fish were shy about coming to the surface. After covering the entire whole alongside the huge boulder pictured above, I switched to a fly with a lot of weight. Returning to the head of the pool, I started working my way downstream again. As one of my drifts swung in front of the smaller boulder at the bottom left in the picture above, I felt a hard thump and the fight was on. I had brought my 5 weight Helios and for a moment I thought that such a light rod would prove to be my undoing. This bass worked through its bag of tricks, but ultimately I landed it in the shallows. After a quick shot, I let it go and continued working down the stream. Not far below, another quality fish came to hand and I got another picture. About this time, Mark and I realized that we should start thinking about the hike out. We were considering a different route back out, but since neither of us had done the whole route we would need extra time in case something went wrong. After a consultation, we decided on a few more fish, a short lunch break, and then starting on our way out. As it turns out, we were both glad that we fished a little longer. Mark had the first nice fish. He had been fishing in a deep hole. Both of us had switched to the same pattern that was catching fish for me. He had thrown at a deep slot along side some undercut boulders and a nice fish shot out to nail the fly. After watching the battle, I told him we needed at least one good fish picture and so he held up the bass for a moment. I had decided to finish my day hunting fish on top again and had pulled out the well-chewed black Chernobyl Hopper and tied it back on. When Mark caught this fish, I was nearly confined to change back. I headed up to the next pool, intent on sitting down to tie on a different fly. As I walked over the boulder that I meant to sit on, I saw one dark slot just above. Deciding it wouldn't hurt to throw the hopper for one last cast, I tossed it in and almost immediately saw the largest explosion of the day. Things got serious for a few moments as the fish repeatedly ran under rocks, sawing my leader and tippet along the rough edges. Somehow, the Rio tippet held as well as the hook. The heavy tension evaporated as I slipped my thump into its mouth. Mark kindly came over and snapped a couple of pictures for me. This is the largest smallmouth bass that I have caught yet on our Cumberland Plateau streams, and best of all it came on a surface fly. By this time, we were starting to realize that we should probably begin our climb out. Scrambling up the steep slope was difficult in the afternoon heat, but the good news was that the brush was not as thick as before. I didn't feel in immediate danger from death by snakes, but before long a new danger showed up. We had been following a trail for a while, knowing approximately but not exactly where to go. A brief pause to discuss which way at a fork proved to be problematic. Almost immediately, as I started moving again, Mark yelled. A stinging sensation on my arm told me what the problem was and I yelled out, "Run!!!" We both found some long since forgotten energy for a brief sprint almost straight uphill before pausing to make sure that the yellow jackets were not following us. Mark had lost a water bottle in the excitement, but neither of us wanted to go back down and recover it. The good news was that we were out on familiar trails again. The car was still quite a trek away but now we knew exactly how far. My nerves were back on alert. This high adventure was almost more than they could handle. When a sticked cracked, I may or may not have jumped a few feet high. Mark, chuckling behind me, asked quite innocently, "Did you know you just jumped?" It had been an incredible day. 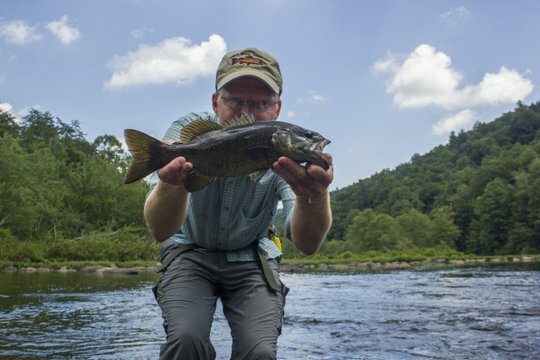 I'm not sure if Mark will be willing to fish with me again after this adventure proved harder than anticipated, but I I'm guessing we'll both recover eventually and be ready to hit the smallmouth streams again.